The world kept changing, and the Erie Canal along with it. Completed in 1825, the Canal has been rebuilt - or enlarged - twice. The original Erie Canal, known as Clinton's Ditch, was only 40 feet wide and four feet deep. New Yorkers discovered almost immediately that the Canal had been built too small, such was its success, and the Enlarged Erie Canal was built between 1836 and 1862, increasing the Canal's depth to seven feet and its width to seventy feet. But even those dimensions proved inadequate to compete with the transportation advancements of the early 20th century. Lock 13 of the modern Erie Canal, the lock you see today, was constructed as part of the Canal's third iteration - the Barge Canal. 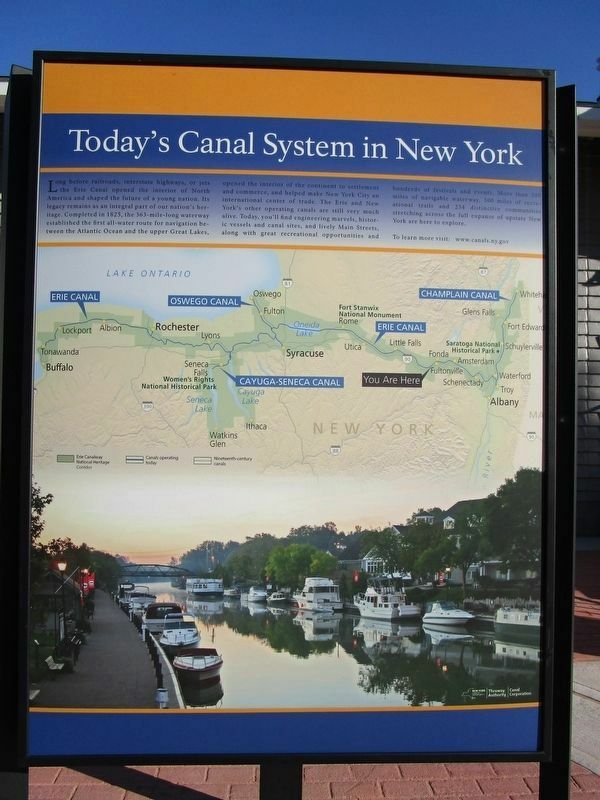 Constructed between 1905 and 1918, today's Canal System takes advantage of New York's many inland lakes and rivers, not just for water supply, but as part of the navigation channel. 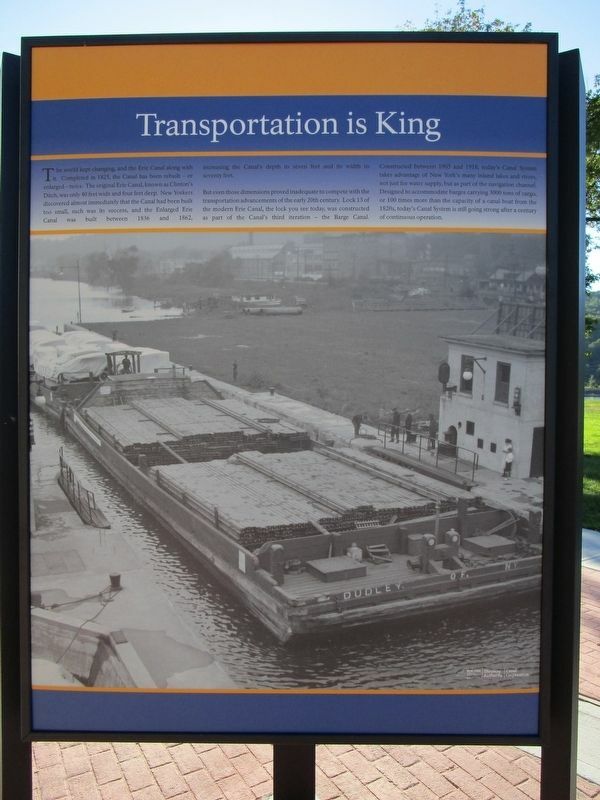 Designed to accommodate barges carrying 3000 tons of cargo, or 100 times more than the capacity of a canal boat from the 1820s, today's Canal System is still going strong after a century of continuous operation. The Erie Canal kept changing. Completed in 1825, the Canal has been rebuilt - or enlarged - twice. The original Erie Canal, known as Clinton's Ditch, was only 40 feet wide and four feet deep. New Yorkers discovered almost immediately that the Canal had been built too small, such was its success, and the Enlarged Erie Canal was built between 1836 and 1862, increasing the Canal's depth to seven feet and its width to seventy feet. The lock that you see today, part of the modern Erie Canal, is evidence of the changes that kept the canal operating. 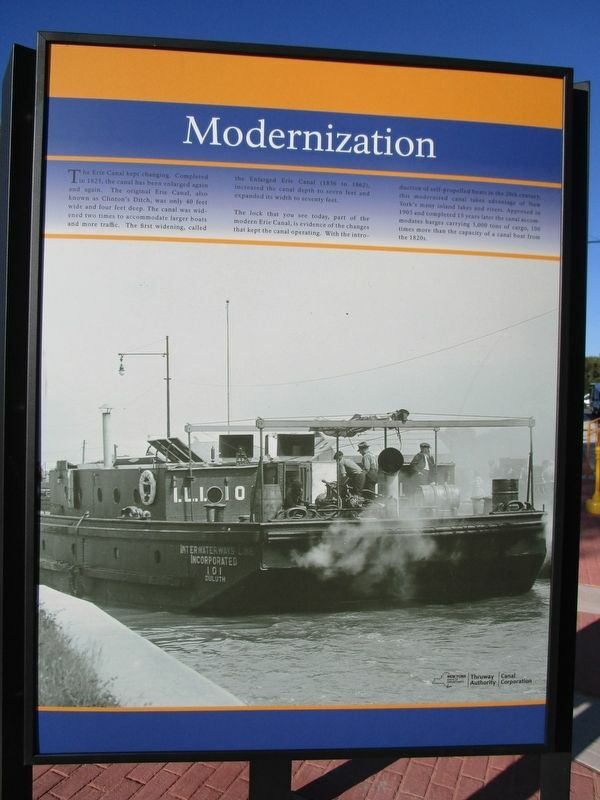 With the introduction of self-propelled boats in the 20th century, the modernized canal takes advantage of New York's many inland lakes and rivers. Approved in 1903 and completed 15 years later the canal accommodates barges carrying 3,000 tons of cargo, 100 times more than the capacity of a canal boat from the 1820s. trade. The Erie and New York's other operating canals are still very much alive. Today, you'll find engineering marvels, historic vessels and canal sites, and lively Main Streets, along with great recreational opportunities and hundreds of festivals and events. More than 500 miles of navigable waterway, 300 miles of recreational trails, and 324 distinctive communities stretching across the full expanse of upstate New York are here to explore. Erected 2016 by New York Thruway Authority / Canal Corporation. Location. 42° 54.997′ N, 74° 26.785′ W. Marker is in Root, New York, in Montgomery County. Marker can be reached from the intersection of Interstate 90 at milepost 187 and Lock 13 Living History Rest Area. Touch for map. 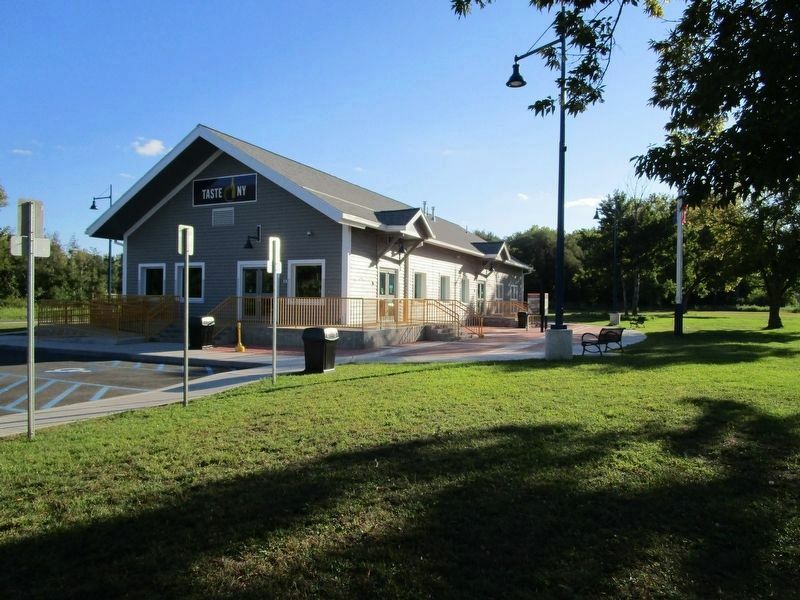 Marker is at a new rest area for I-90 westbound travelers between exit 28 (Fultonville) and exit 29 (Canajoharie). The rest area is at Lock 13 on the Erie Barge Canal. It officially opened on August 11, 2016 at 11:30 am. Marker is in this post office area: Fultonville NY 12072, United States of America. Touch for directions. By the north side of the rest area building, the marker is a tri-panel, pictured here to the left of the lampost and behind it. (within shouting distance of this marker); The Erie Canal (within shouting distance of this marker); a different marker also named The Erie Canal (within shouting distance of this marker); Dam. That's Not a Bridge? (within shouting distance of this marker); a different marker also named The Erie Canal (within shouting distance of this marker); Then and Now (within shouting distance of this marker); a different marker also named The Mohawk Valley (within shouting distance of this marker). Touch for a list and map of all markers in Root. More. Search the internet for Transportation is King / Modernization. Credits. This page was last revised on March 20, 2019. This page originally submitted on September 9, 2016, by Anton Schwarzmueller of Wilson, New York. This page has been viewed 172 times since then and 12 times this year. Last updated on March 9, 2019, by Steve Stoessel of Niskayuna, New York. Photos: 1, 2, 3, 4. submitted on September 9, 2016, by Anton Schwarzmueller of Wilson, New York. • Bill Pfingsten was the editor who published this page.